Wonderful Wedding Show in Winnipeg - Thanks for coming out and paying us a visit! We really wanted to say thank you to everyone who came out to visit us at the show. It was our first year there and it was with a warm welcome indeed! I feel confident that we showed you, our guests, that we truly believe weddings are about being distinctive and style infused. We also strive to be very different than any travel agency. We specialize in destination wedding planning and a local wedding coordinating as well as being a travel agency. We think weddings should reflect your personality and by bringing something different to the decor or theme. We want your guests talking to be about your event in an amazing way for years to come. Here are some pictures of our booth and a little bit of our inspiration! Travel & Events with Style has always strived to go beyond what most think is what a wedding should look like whether it is here or abroad. The décor we chose was an infusion of a destination wedding in Thai Land, Bali and with a modern twist. The bubble décor theme was a fresh take on the typical jewel accents you currently see everywhere. The back drop included acrylic orbs that refracted the up-lighting with larger glass ornaments holding tea lights. Our table took the tropical theme of palms and Macara orchids and united them in a 4 foot elegant vase that gave a hint of a tropical palm tree. There where tiered demission accents with smaller hanging orbs. These smaller orbs held blue and orange orchids and tear drop jewels for a tropical rain forest yet glamorous feel. The linens where layered in the same colour scheme. A papaya coloured overlay with a golden shimmer and olive green linen under it grounded the look. Place settings where layers of Mahogany wood place mats, green chargers, royal blue table clothes and intricate satchels as party favour gifts. The table was finished off with Mahogany Chiavari Chairs that where left simple and clean, which allowed for all the other colours to come forth with out being over done. Lastly, the cocktail tables where covered with Peacock blue linens with a royal blue shimmer, royal blue ties and bubble glass vases in tiered sizes. Inside the vases where blue/purple orchids wound with bear grass. It was a distinctive look and can be introduced anywhere and will be remembered. It was the show stopper that kept everyone interested. We added cultural accents whenever possible to give the exotic look. Metal urns and vases where introduced in varies areas which added different texture and supported the theme. We used the largest urn for our ballet draw, which would be perfect for any presentation collection at your wedding. It is important not to be afraid of colour. If done correctly and grounded correctly, it can have an amazing impact and leave your guests wowed! Adding themed accents that are not usually considered wedding décor can make the impact that this day is a reflection of your personality! When we look for decor for a wedding, we really take the time to look off the beating path. Our firm doesn't believe you should have to choose from package A, B or C to have decor. You are an individual, thus so should your event be! 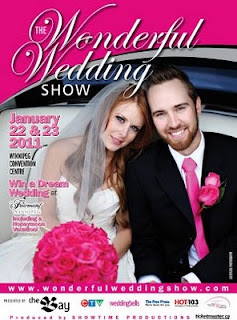 We wanted to ask everyone to visit us at the Wonderful Wedding Show in Winnipeg at the Convention Centre January 22 & 23, 2011 from 11am - 6pm. It will be our first time at the show and we thought it appropriate to show Winnipeg that destination weddings can be low stress and style infused when you do it With Style. There are a ton of travel agents who have the knowledge and there are wedding planners who sport destination weddings on the side here in Winnipeg, but our firm takes them very seriously and specializes in them 100%. From high style destination weddings in the province or distictive destination wedding abroad, we are your perfect cocktail to a wedding dream come true. When looking for us at the show, look for the palm leaves and orange Macara Orchids. Colour upon colour, but style infused all the way!